The only hardware vocal processor with Antares Auto-Tune pitch correction and vocal modeling. Co-developed with Antares Audio Technologies, the TASCAM TA-1VP vocal processor brings together everything you need for a polished, modern vocal sound. 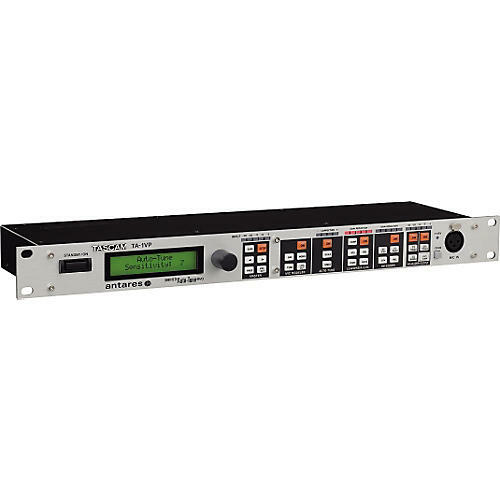 The rackmount processor includes a microphone preamp, compression, de-essing, microphone and tube modeling, and Antares' world-famous Auto-Tune pitch correction. Perfect for live performance, house of worship or studio use, the TA-1VP brings your vocal sound into the 21st century. A high-quality XLR microphone input is provided on the TA-1VP front panel, with phantom power for condenser mics. Processing is laid out in simple-to-use blocks on the front panel, each with dedicated buttons and meters to show you exactly what's being done to the signal. Antares' microphone and tube modeling takes the input signal and gives it the character of another microphone, with a library of classics to choose from. The De-essing module removes sibilance from your signal before variable-knee compression and gating. A great-sounding digital EQ is last in the chain before output. The Auto-Tune module can be set for any level of pitch correction, in a variety of user-selectable scales. All settings can be recalled through presets on the front panel or through MIDI. Balanced TRS input and outputs are located on the rear panel, including a Double-Track out for simulating doubled vocals. A S/PDIF digital output is also provided. Built for every audio application from live performance to studio mixdown, TASCAM's TA-1VP is the only hardware processor with Auto-Tune technology for flawless vocal intonation. Get on the signal path to perfect vocals. Order your TA-1VP today!